The TMS320TCI6614 Evaluation Module (EVM), or TMDXEVM6614LXE, is an easy-to-use, cost-efficient development tool that is designed to help developers quickly get started with designs using the C6614 multicore DSP. It includes an on-board, single C6614 processor with robust connectivity options specifically SFP connectors on the Antenna Interface to enable direct connections to other platforms for small cell applications. 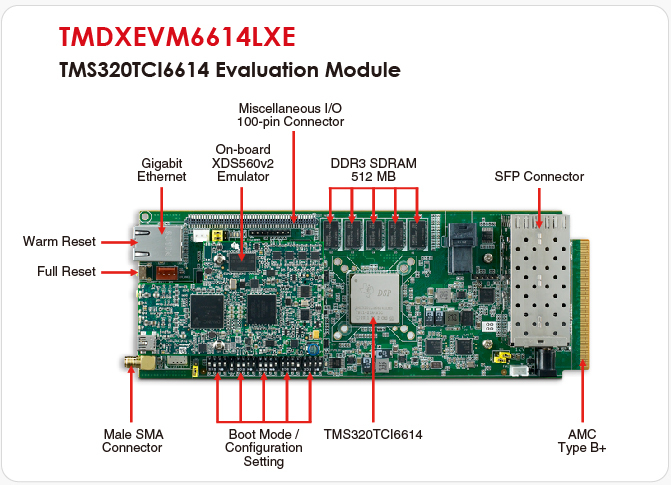 The software accompanying the C6614 EVM includes the Code Composer Studio™ Integrated Development Environment version 5.1 (CCS v5.1), and the Small Cell Multicore Software Development Kit (SC-MCSDK) that includes the Board Support Package (BSP), Chip Support Library (CSL), Power On Self Test (POST), Network Development Kit (NDK), SYSBIOS, and Out of Box (OOB) Demonstration software. TMDXEVM6614LXE - TMS320TCI661 Evaluation Module with XDS560V2 Emulation The TMS320TCI661 EVM comes with XDS560V2 onboard emulation capability. The included XDS560 mezzanine card uses the TI 60-pin JTAG emulation header. u-boot boot loader for loading and running Linux kernel. Device Tree. Boot with device tree blob saved in the UBI volume or TFTP from a TFTP server. •	UBI/UBIFS – For NAND flash filesystem. Also support NFS root filesystem. •	Device tree support for customizing KeyStone Linux drivers. •	Multicore boot – Remote Proc driver to boot the DSP from ARM.using shared memory. Note: FPGA code for Rev 2.0 is updated to v0004 and is available in "Support & Download "